Having always wanted to go to HOTB I found my chance one day when scouring the area while feeling indecisive about where to brunch. I’ve been before for drinks and while I usually don’t revisit after I’ve had food, I didn’t get everything I wanted to try and will most likely go back after this visit to try their burger and cheese steak and steak. It was getting quite late and we decided not to ruin lunch and went for a slightly light brunch; ordering the buffalo cauliflower; BBQ ribs and the fried chicken and waffles. While that may not be light for you it was definitely not a classic brunch for me. The cauliflower came out first and for anyone thinking it would be a slightly healthy, you would be dead wrong. 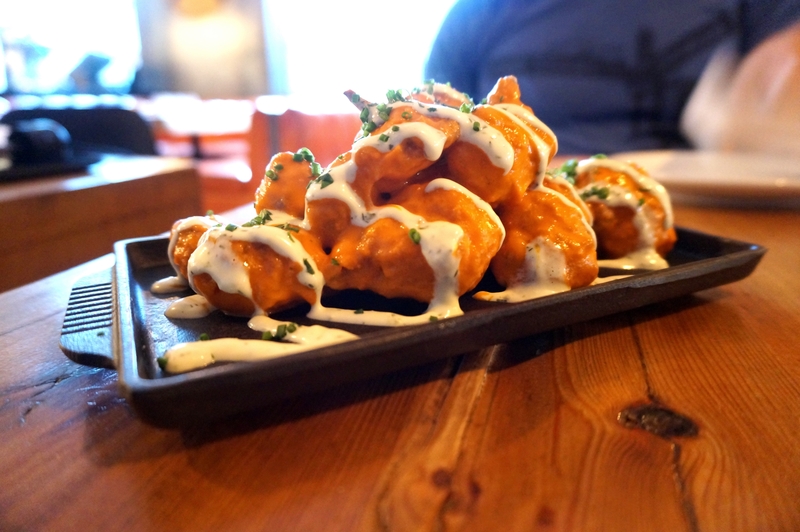 It was battered; deep-fried and tossed very liberally with their homemade buffalo sauce. While they were fantastic morsels of fried goodness I would have preferred the cauliflower to have been flash fried and sauced rather than battered, it was a bit too much. 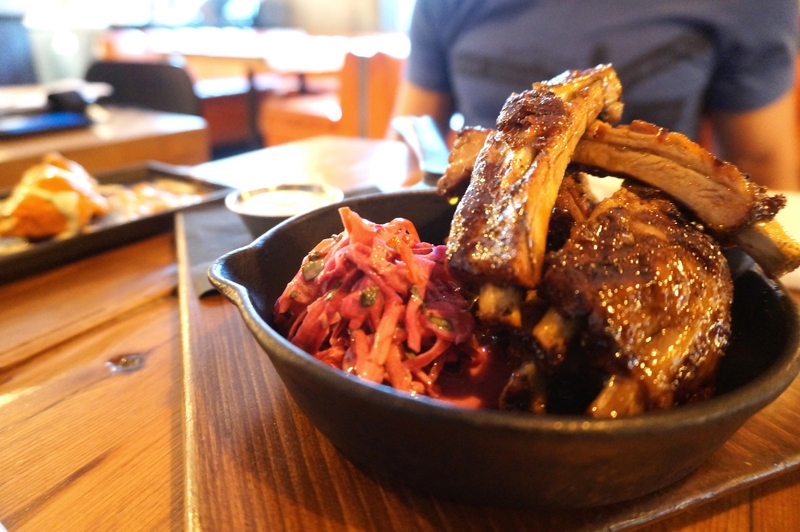 The Ribs and Chicken and waffles came out next; the ribs were interesting, dry rubbed style with a glaze more than a sauce that was ever so fleeting, I didn’t mind the flavour but it was great by any means. The meat was fall of the bone, a little too much if you ask me, as you went to pick up a rib the meat started to fall off before it got to your mouth. These were not to my liking, that being said, they could be to yours. Lastly the chicken and waffles; my standard go to brunch dish really; this was a different style for me, the chicken was great, crisp, juicy and flavourful and fantastic with their sauce; the waffle on the other hand was their own style which, in my opinion, didn’t complement the style of chicken and waffles, it was too dry and crunchy; not giving the dish it’s roundness of juicy crisp chicken with fluffy waffles. While an overall tasty meal I was oddly underwhelmed by the dishes ordered, the burger and cheese steak hopefully can redeem my opinion of the restaurant. 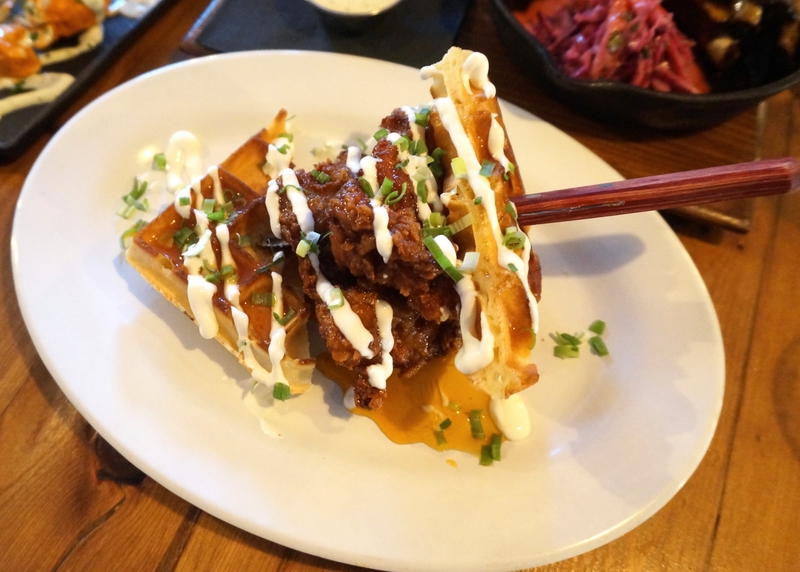 Posted on December 24, 2015 by AdrielPosted in Brunch n Lunch, Fried Chicken, Ribs, TorontoTagged Brunch, fried chicken, Ribs, waffles.